I have a thing about lip balms. There needs to be one within reach at all times. For example, there is one in my desk drawer, one on either side of my bed, one in the kitchen, two in the car…and several more in my handbag (excluding those in my laptop bag). Some people might say I’m obsessed, but I like to think that I take lip nourishment seriously and I don’t do cracked or dry lips! Now that you have some background, when I say that Labello’s Lip Butter is my current favourite, people need to realize that there is some stiff competition for that spot! When you purchase it in the store you will find it packaged much like you would a “traditional” label (with a cardboard backing and a hard plastic wrapper). Not exactly glamorous, but the product itself is housed in an unassuming little tin of which I am quite fond. Enriched with shea butter and almond oil, this is a slightly greasy (but not in a bad way) super-hydrating balm. It goes on easily and is not absorbed quickly, but at the same time does not leave you feeling like you have a dollop of lipgloss on your lips. It comes in three flavours – Original, Vanilla & Macadamia and Raspberry Rose. I’m crazy about the Original but was interested to try the others. Vanilla & Macadamia smells a but too sweet for my liking but once it’s on your lips it’s great. Raspberry Rose just reminds me of raspberry mix-a-drink or Sparletta, but again once it is on your lips, the flavour is not overpowering at all. Raspberry Rose is pink in colour, but only slightly (so it’s not a tinted lip balm). These great little lip butters will only cost you R30 (R29.99, depending where you stop) and they last a super long time! I’m still using my first one and I must have had it for at least three months if not longer already! 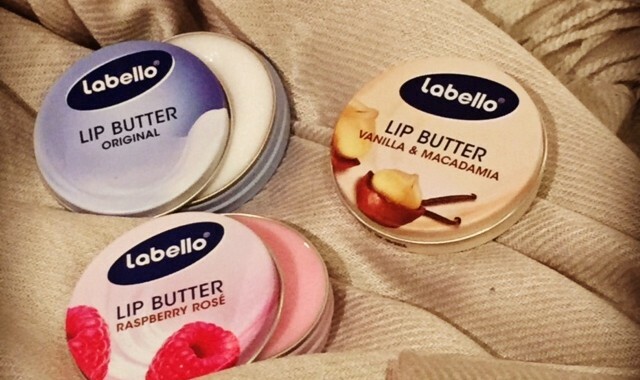 The Spa Life highly recommends Labello’s Lip Butters and they are cheap enough that you can buy all three and try them out for yourself to find your favourite! Posted in Spa Product Reviews and tagged Face, Labello, lipbalm, lips.